... The DeRo Foundation is the next step in De Rosario’s mission to enrich kid’s lives, starting with soccer laying the groundwork. And that’s what makes the DeRo Foundation so unique; funds from the Foundation do not just focus on soccer. 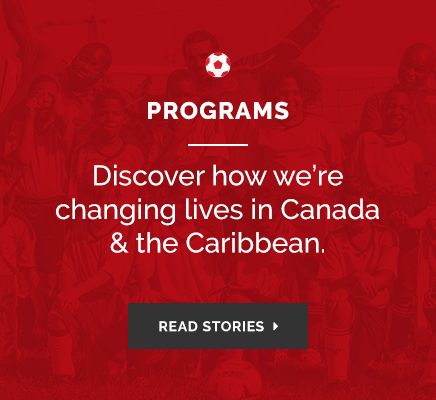 Instead, it uses the sport as a platform to promote education, health, and money management to Toronto’s high risk youth; soccer acts as the catalyst to help improve many other aspects their lives. Hearing De Rosario explain his vision, listening to him talk about why he does what he does, it easy to understand—and stand behind—his passion and enthusiasm. This is because De Rosario does not give a pitch or an elevator speech; he doesn’t memorize lines or knows how to instinctively work a room. What he does is a lot more compelling—and a lot rarer. He speaks from the heart, he speaks from honestly, and he speaks from firsthand knowledge. He has seen the influence and impact soccer has had in his life and he wants to share that experience and support with children who may not otherwise have any other means of obtaining that direct mentorship. And it’s not “just” about soccer and De Rosario recognizes that; the DeRo Foundation helps kids look beyond the pitch and teaches them an innovative and holistic approach to life. And that’s what Saturday night was about, the opportunity for De Rosario to share his vision for his new Foundation.